Dr. Rebecca Kryzak grew up in Kingston, NY on a small “hobby” farm with many pets including a horse, pony, goats, dogs, cats, chickens, ducks and geese. Growing up with all those animals, there was no question what she would spend the rest of her life doing. Dr. Kryzak completed her undergraduate studies at the University of Albany and earned her DVM from Kansas State University College of Veterinary Medicine. She saw the need for for a house call veterinary service in the Capital District and opened Cottonwood Creek Veterinary Services in June 2010. Dr. Kryzak has also completed advanced training in Traditional Chinese Medicine at the Chi Institute in Reddick, Florida. Dr. Kryzak’s specific interests include acupuncture, herbal medicine, food therapy, geriatric medicine and pain management. She enjoys taking the best of both eastern and western modalities to increase the quality of life for her patients. She also has a strong interest in performance and sports medicine. When not working, Dr. Kryzak enjoys spending time with her husband, three dogs and three cats. She also enjoys hiking, archery, snowmobiling, reading and bee-keeping. 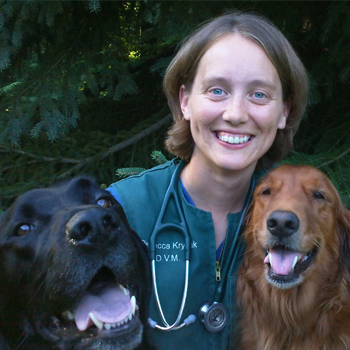 She is a member of the American Veterinary Medical Association, New York Veterinary Medical Society and the American Association of Traditional Chinese Veterinary Medicine.